Raffles Design Institute, Asia-Pacific's largest international design school, is now in the Philippines! Their Manila campus is located at 18th and 19th floor of the Accralaw Tower in a very posh place of Global City, Taguig. Over a week ago, I received an invitation to attend a series of workshops entitled "Conversations on Fashion and Design" from RDI Manila. I immediately confirmed because of the interesting topics, plus the fact that I've never been to a design school before. Miss Meg Aguirre, RDI Manila's Educational Consultant, gave us a short introduction of the school, the courses they offer, and the program for the day. Afterwards, we were able to look around and take photos of every section of the 18th floor. Clockwise: sample designs of the students, drafting studio, sewing workshop, library, and drawing room. The Interior Design Workshop: “The Eco-Friendly Condo: 15 Ways to Ethically Upgrade Your Home.” started. It was given by Mr. Lee Miles who taught us how to make a better living space through the use of eco-friendly materials. The third talk under Fashion Marketing and Management was given by the pretty Miss Nela San Jose. It was entitled "Fashion Trends: The Past Inspiring the Future" wherein she talked about trends from the 1920s to the present. This was my favorite workshop because it helped me upgrade my knowledge about fads and trends. Thank you so much Miss Nela! I enjoyed sitting next to you and chatting after the workshops. The Visual Communication Workshop came second to the last. It was entitled "Thinking Visually in Design in the Digital Age" by Buz Walker-Teach. It taught us the importance of keeping a sketchbook just like keeping a journal to be able to document daily experiences by the means of drawing or simply doodling. Lastly, there was this Fashion Design Workshop: "Local Touch, Global Reach - How To Translate Filipino Products for a Global Market". It was brought to us by Dr. Janet Emmanuel, the very friendly Academic Director of RDI Manila. She made Our Tribe a perfect example of a Filipino product that needs some global translation. Thanks for the very warm welcome Dr. Janet! I had fun talking to you and the rest of your team while having lunch. Me against the Raffles wall. Raffles Design provides quality education through its network of education institutions to develop industry-relevant skilled professionals. It was established in 1990 and currently operates 38 colleges in 34 cities across 14 countries in the Asia-Pacific region. More than 28,00 students are enrolled in Raffles Education Corp's tertiary programs. It employs over 3,000 academic and administrative staff. Too bad I don't have a huge enthusiasm to study anymore. I swear I will take a fashion course from this school if only I'm still a teenager. 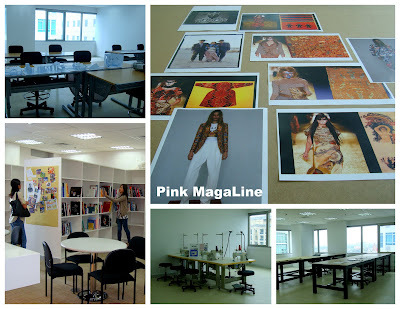 If you girls are interested in fashion and design, don't hesitate to choose them. Good news that they are still accepting enrollees for the July Intake.